The early history of McGill University Library’s (MUL) collections is populated with illustrious donors. The names of Peter Redpath, John William Dawson, and William C. McDonald still resonate today, especially with those familiar with the university’s campuses. In contrast, the name of John Robson has nearly been forgotten. Yet, with the exception of Redpath, no other donor had as pivotal a role in shaping the early library collections. The bequest of his library was the single largest donation of books made to McGill before 1893, the point at which the modern library came into being. So why are so few people today aware of his existence or of that of his collection? Robson’s copy of Lucretius’ De rerum natura (Lyon, 1576) bearing his inscription dated 1823. McGill RBSC PA6482 A2 1576 (USTC 141351) On the significance of this title, see Stephen Greenblatt’s Pulitzer prize winning The Swerve: How the World became Modern, 2011. The first complete private library to be presented to MUL, Robson’s collection was made up of materials “relating to Medical Science, History, Archaeology, Classical Literature, &c., &c.”. He donated a remarkable 3763 items to McGill in total. Nineteen cases containing 2597 volumes and 327 pamphlets arrived in July 1870, and another 839 volumes followed four years later upon Robson’s death on 9 December 1873. To put this into perspective, the MUL collection had previously counted only 5926 volumes. Thus by sheer volume, the Robson donations had an enormous impact on the library’s early collections, increasing their size by nearly 50% with the first shipment alone. Perhaps more importantly, they also augmented the library’s holdings in terms of quality and depth. According to his contemporary P.P. Carpenter, “the most valuable part of the Robson Collection consists of a series of works in Archaeology, of which science he [… was a] very assiduous and successful prosecutor”. Carpenter further noted that “Dr Robson had the [reputation] of being an accomplished classic scholar, and also a scientific physician; and therefore there will probably be many valuable books in both of these departments, as well as in general literature.” Those books from his collection that have survived and which we can identify as having belonged to him reflect these varied interests, his voracity as a reader and his enthusiasm as a book collector. In his lifetime, Robson amassed an impressive amount of older printed materials. 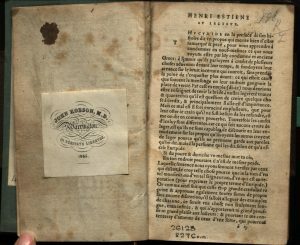 His collection’s contents spanned the history of printing up till that point with many volumes dating from the sixteenth and seventeenth centuries. As a result their arrival in Montreal enriched McGill’s historical holdings, notably with its first incunabulum. The contents of his collection remain of importance today in their reflection of book history within the larger MUL collection. One might then ask why this collection has been forgotten. For one thing, the collection lost its integrity by being split up and distributed thematically amongst the other books in the collection. The relative proportion of the Robson bequest compared to the library collections at the time or their arrival presumably made it impractical for it to be kept separately and identified as a collection on its own. It does not appear to have been labelled in a similar manner to the contemporary Peter Redpath Collection. So while the Robson collection may have overwhelmed the MUL collection at first, it was in fact dispersed within it. As the MUL collection grew, the proportion of Robson books shrank and they were increasingly spread out. An example of Robson’s more elaborate bookplate dated 1865 in his copy of Henri Estienne’s L’introduction au traité de la conformité des merveilles anciennes avec les modernes ([Geneva], 1579). McGill RBSC PQ1621 A6 1579 (USTC 323). This is one of a multitude of variants that exist of this controversial title. Another factor that contributed to his lack of enduring public recognition is that Robson lacked the illustrious status of other donors. His connection to McGill and Montreal was rather distant and it seems to have been a question of chance that he chose to donate his library to this institution rather than another. It was through P.P. Carpenter, who had recently donated his vast collection of shells to McGill’s museum that Robson heard of the young college from his home in Warrington, near Manchester, England. Lacking the financial clout or social lustre of benefactors such as Redpath, Dawson or MacDonald whose repeated and significant contributions to the university kept them in the public eye and the historian’s mind, Dr Robson was quickly forgotten. Given Robson’s interest in early prints, it seems appropriate that it is through bibliographical interest that he is now being rediscovered. As we worked on the Inventaire des imprimés anciens au Québec, traces of Robson’s impact on the MUL’s early collections resurfaced frequently. 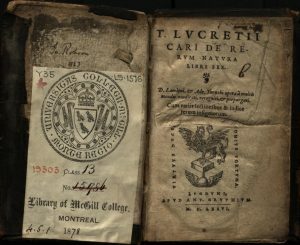 Volumes held in Rare Books and Special Collections (RBSC) bear two versions of his personal bookplate, the occasional inscription, and presentation labels affixed when his library arrived at McGill. These marks have survived remarkably well, but this is not the only reason why his volumes are of interest for their provenances. Indeed, paradoxically, Robson’s lack of status and equivalent budget are proving to be of benefit in the long run. Carpenter noted that “Dr. R. was never in any other than very moderate circumstances”; this meant that he did not have the volumes he collected rebound with elegant nineteenth century bindings as did so many of his better-heeled contemporaries. As a result the marks left by the book’s former owners and readers were spared from the destruction caused by rebinding. 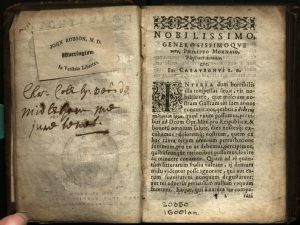 The volumes’ earlier history remains intact and accessible to researchers today, directly illustrating early print and reading culture. Robson’s simpler bookplate figures in an edition of Polyaenus’ Strategemata ([Geneva], 1589). McGill RBSC PA4390 P5 1589 (USTC 451206; GLN 3383) Its printer Jean II de Tournes, former printer to the king of France based in Lyon, had by this time fled to Geneva. So while Robson’s books are now scattered across the shelves in RBSC and only conceptually form a collection, the signs that he and others before him left on and between their covers speak eloquently of their production and use. 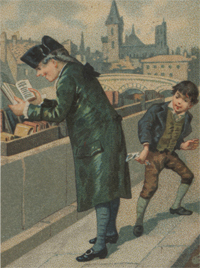 They speak to us of engaged readers, of a provincial physician from nineteenth century England with a taste for old books, and of his undeniable impact on McGill University Library in its early years. Annual Calendar of McGill College and University, Montreal (1872-73). Montréal: J. C. Becket. C. F. Markgraf (1870, October 26). Memorandum as to Number of Books in Dr Robson’s Donation Octr 26th, 1870. McGill University Archives (Accession no. 927, Bundle 21, Item 9), Montreal. P. P. Carpenter (1870, July 30). [Letter to Sir John William Dawson]. McGill University Archives (Record Group 4, Container 439, File 11296), Montreal. This was noted by his biographers: W. Robson & Kendrick (1876). Memorials of the late Dr. Robson, of Warrington. His life and writings. Transactions of the Historic Society of Lancashire and Cheshire, 3(4), 177.